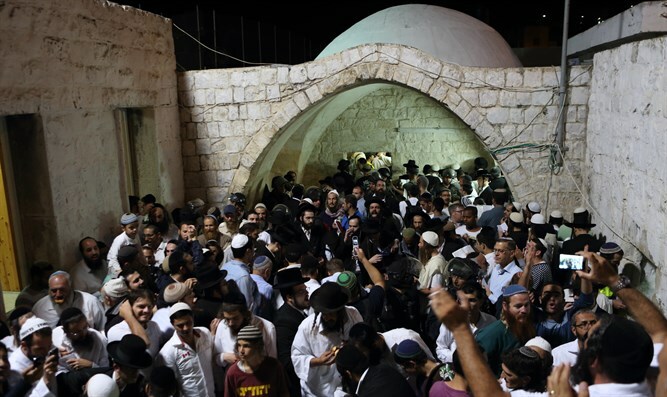 1,200 people attend Selichot services at Joseph's Tomb on the anniversary of the day the government abandoned the holy site. The State of Israel held a special ceremony last night at Joseph's Tomb, 16 years after the holy site was abandoned. 12,000 people came to Joseph's Tomb for Selichot services. Among the worshipers were Religious Affairs Minister David Azoulay, Yossi Dagan, the head of the Samaria Regional Council, Rabbi Elyakim Levanon, the Head Rabbi of the Samaria Regional Council, and Moshe Cohen, head of the Religious Council of Samaria, who hosted Azoulay together with members of his staff. lso among the worshippers was the family of Hillel Lieberman, who was murdered by terrorists exactly 16 years ago when the army abandoned Joseph's tomb. His body was found several days later in a nearby cave. Yossi Dagan was one of those who took part in the search for Lieberman's body. At the services he spoke of that night. We are here on the exact day Hillel was killed. It is also the anniversary of the day the State of Israel abandoned Joseph's tomb on the night of Selichot. We beseech the gates of heaven that this should be a year in which we can pray without fear. In which we can pray in private and in public, day and night. I urge the government to repent of its actions and express its sovereignty her at Joseph's tomb to correct the injustice done here 16 years ago." Azoulay, who came to the tomb with his wife and daughter, expressed his excitement from the stand. "I want to thank the Samaria Regional Council and the IDF for the holy work they do here. And everyone who strengthens this place shall be blessed. We pray that the Land of Israel shall belong to the People of Israel."